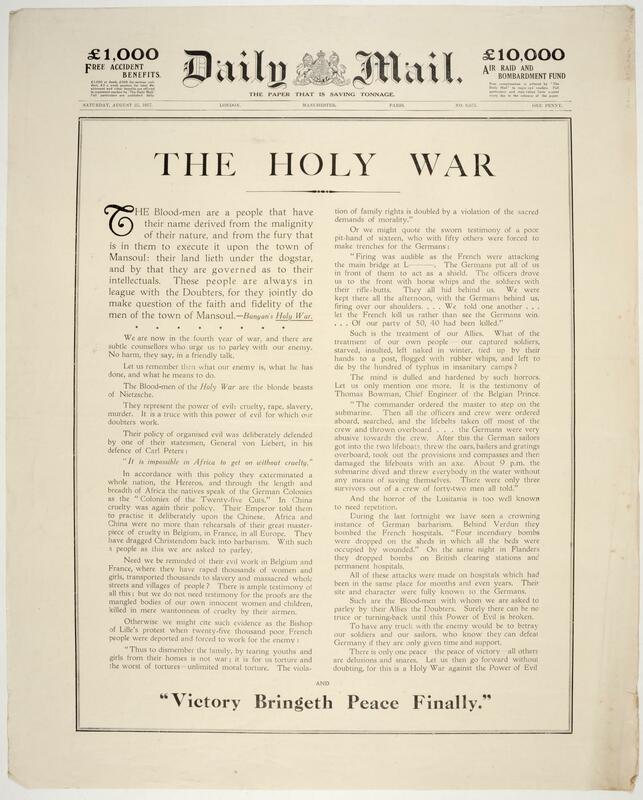 First World War recruitment poster; 'The Holy War. Victory Bringeth Peace Finally'; published by the Daily Mail, London; Saturday August 25th 1917 no. 6675 Copy of Daily Mail article, Entitled THE HOLY WAR, it is an attack on German depravity, describing Germans as the 'blonde beasts of Nietzsche' who have 'raped thousands of women and girls...(and) massacred whole streets and villages of people'. The Germans are said to have 'flogged' captured allied soldiers and left them to die. The article concludes that 'this is a holy war against the power of evil' and it quotes from the writer John Bunyan to back up this sentiment.